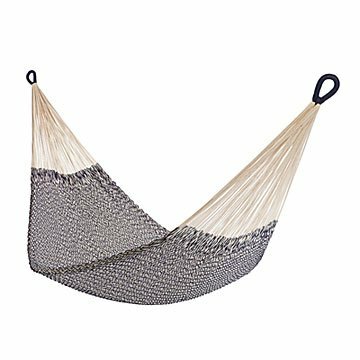 This ultra-cozy hammock-for-two helps support the indigenous people who make it. Doing good in the world has never been so comfortable. This ultra-cozy hammock-for-two helps to support the people who make it—members of a small village of endangered Mlabri people in northern Thailand. The Mlabri were nearly wiped out in the mid 20th century, when the teak forests of their home were cut down for decorative wood. But they have begun a resurgence by turning to their traditional weaving skills as a source of sustainable income for their community. This hanging hideaway is hand-woven from three miles of soft, hand-dyed cotton cord—an intensive process which takes six to seven days to complete. A spacious retreat for one, the hammock is woven extra wide so it can also accommodate two loungers side by side. It's designed to support a combined weight up to 400 pounds, and comes in a handy tote bag made from weather-safe canvas. Handmade in Thailand. Make hanging your hammock a breeze with our easy to use Hammock Tree Straps. Shop our entire Do Good Hammock Collection. Click here to see hanging instructions. Click here to see how your hammock is making a difference. Visit the blog to learn more about the Do Good Hammock, its uses, and the people who make it. Yellow Leaf Hammocks is working to spread social change through their lighthearted philosophy: Do Good. Relax. Take in when raining. If needed, hand wash in cool water with a mild non-bleach detergent. Secure scale lines before washing to prevent entanglement. Rinse thoroughly. Hang to dry. Detailed hanging instructions included. Purchase our Hammock Tree Straps for easy hanging. I love this hammock! The company behind it is really amazing and I love how it's signed by the woman who made it! This was my second hammock (replaced my old one from Mexico) and this is a much higher quality hammock than what I previously had. The yarn is super soft and stretchy, so it fits me plus my pup who loves to get in too. Great place to relax after work.